LG’s flagship V30 comes with a heart-wrenching 6.0 inches bezel-less display, face and voice unlocking feature, 6 GB RAM, and 13 MP primary camera. The system runs on Android Nougat 7.0 OS and can carry an SD card of up to 256 GB storage space. The V30’s Hi-Fi Quad DAC digital filters offer you an immersive and detailed listening experience.Thinking of getting this set? Check out 10 best screen protectors for LG V30 in this list below! Made from premium quality AGC glass, this is a 9H hardness tempered glass screen defender for LG V30 that offers 99.9% light transmittance. The 0.2mm thin and explosion-proof glass protects your phone from scratches, scrapes, dust, debris, daily wear, and tear. Your subtle touches are easily transferred to the screen below. Offers easy and bubble-free installation. Specially designed for LG V30, this is a 0.33mm thin tempered glass screen defender that offers an exhilarating touchscreen sensitivity. The unit features a hardness of 9H to prevent scratches, scrapes, dust, debris, daily wear, and tear. An oleophobic coating prevents the housing of fingerprints, smudges, and oily handprints. Lets you unlock your phone in seconds! Backed by IQ shield’s lifetime warranty, this is IQ shield’s screen defender made compatible with LG V30. The ballistic tempered glass featuring 99.9% transparency maintains retina clarity and original display’s resolution. The glass is made 0.33mm thin and transfers your touches neatly to the screen below. The screen’s 9H hardness protects against scratches and scrapes without adding bulk to the device. The bubble-free installation makes the process frustration-free. Specifically designed for LG V30, this is a 3D full coverage screen defender manufactured using a thermoforming technique to bring you a real curved edge screen. The 0.25mm thin glass is virtually invisible and adds no bulk to your device. The 9H hardened glass is made resistant to scratches, scrapes, dust, debris, daily wear, and tear. The glass itself is made anti-fingerprint and offers a smooth and frictionless touch. The rounded edges make the unit case compatible and prevent edge chipping. Specially designed for LG V30, this is a 9H hardness tempered glass screen defender that provides maximum protection to the flat portion of the device using laser microdissection. The scratch-resistant tempered glass screen protector can effectively protect your LG V30 from unwanted scuffs, scratches by keys, and other sharp objects. Magnetic adsorption along with bubble-free adhesives allow for an easy installation. No residue is left when the protector is removed to allow a repeatable installation. The phone’s original resolution is maintained well. The package comes with 2x screen protectors, microfiber cleaning cloth, alcohol package, and dust stickers. 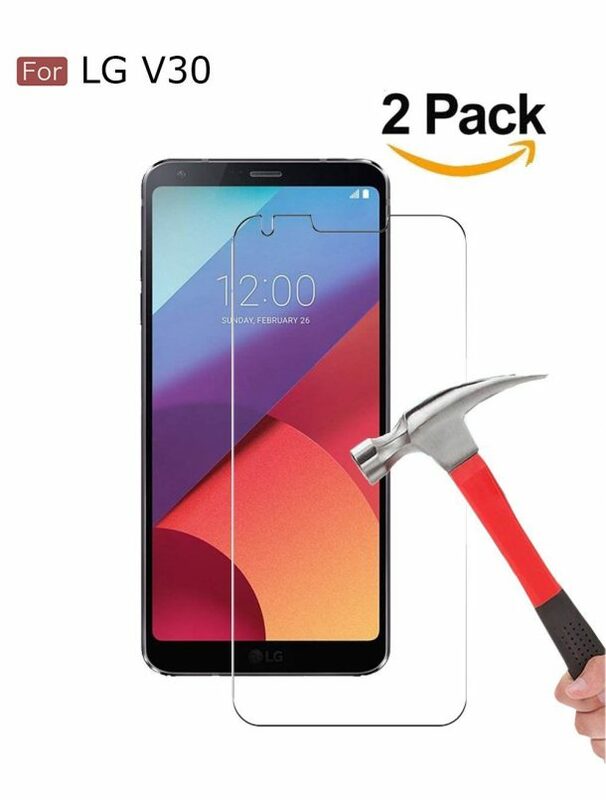 This package by MP-Mall comes with three pieces of screen defender to fit your LG V30. Your device is protected from ruthless scratches, scrapes, drops, shocks, daily wear, and tear. The 9H hardened screen lies in the table just below of diamonds’. The film seamlessly bonds with the display without leaving any gaps or bubbles. Your device’s touch sensitivity is left unaffected. Rounded edges prevent edge chipping and enable case compatibility. This is a pack of three tempered glass screen defenders featuring a hardness of 9H. The glass is made scratch-resistant, shatterproof, anti-skid, and protects your phone from high impact drops and shocks. An oleophobic coating keeps your screen free from fingerprints and oily smudges and makes it easy to clean. Precise laser cutting offers an exact fit. Backed by illumiShield lifetime warranty, this screen defender is exclusively engineered for LG V30 and is designed to resist and absorb shocks unlike traditional PET and TPU protective screen covers. An oleophobic coating repels fingerprints and grime. The 99.9% transparency helps to enhance sharpness and detail while improving the user experience drastically. The ‘Glide Touch’ precision keeps the screen fully responsive. Precisely cut to fit LG V30, this is an ultra-clear HD screen defender that allows optimal viewing experience. The defender is made highly durable and scratch resistant to protect your display from scratches, scrapes, dust, debris, daily wear, and tear. The package comes complete with a screen defender, wet/dry wipes, and dust removal stickers.